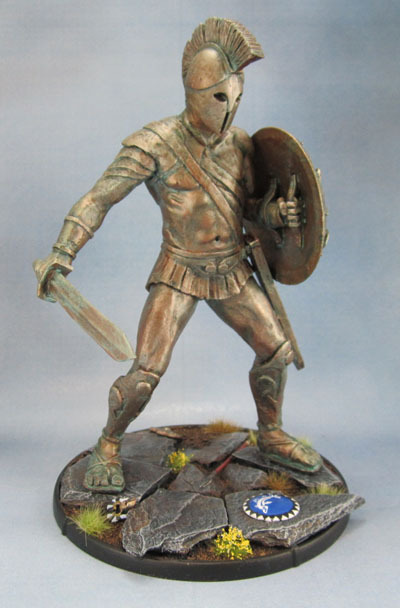 Painting December: Talos Completed! | Azazel's Bitz Box. Mantic Terrain Crate - First bits of painted scatter. Probably should have waited and called this post “Day of the Talos”. Ah well. Done now. Aside from my agonising over how to get the verdigris done, the model was quite an easy and low-stress paintjob. Certainly the painting was much more pleasant than the assembly, which destroyed 2 drill bits. 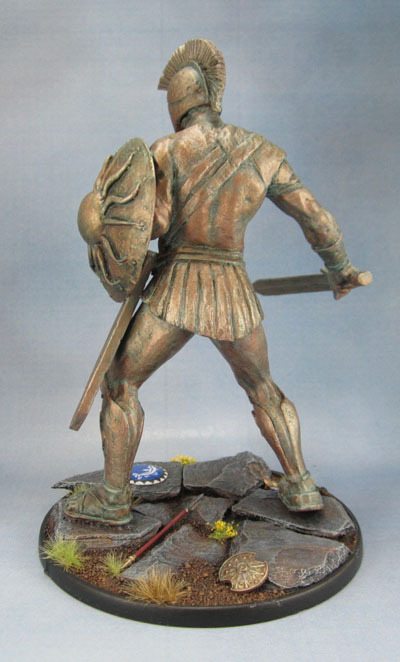 In the end I went for a direct inspiration from Ray Harryhausen’s Talos from Jason and the Argonauts (1963) regarding the dead, dark eye sockets as well as (and more importantly) the weathering and verdigris, though mine is more “gold-brass” than the “copper-brass” of the film. 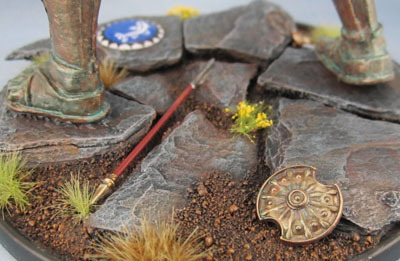 The colourful shield adds a spot of interest to the base, as do the flowers and the reddish wood of the spear. The freehand dolphin design is based on images of Greek shields, and provided me with something fun to add to the model, since it’s the sort of thing I really enjoy doing. I considered adding some damage to the paintwork, but decided against it. Naturally, I didn’t notice the errant hair when I took these photos. Luckily, it’s not stuck to anything. 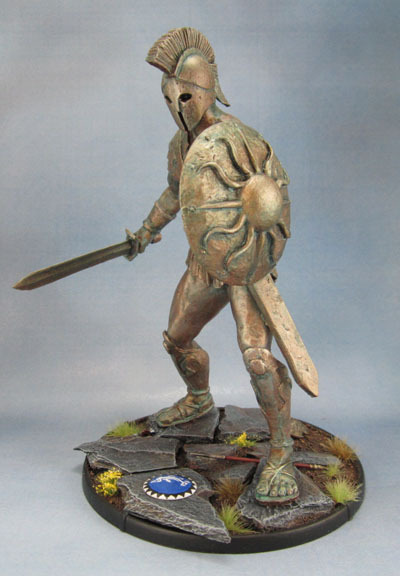 I’ll have to fix the small tide mark on the bronze shield, though. Finally, a scale shot. This model is easily the largest miniature I’ve ever painted. 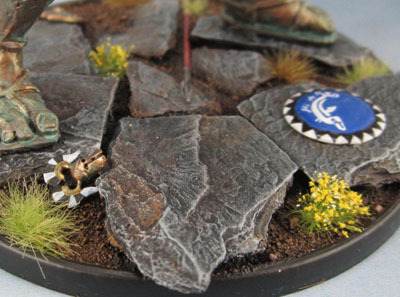 I really need to get more of my impressive centrepiece models done in the coming years. 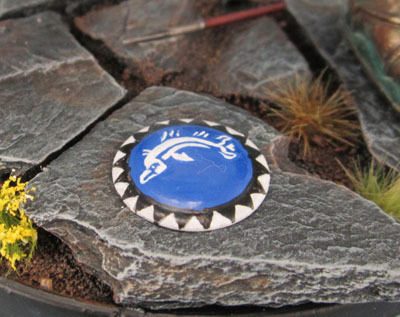 When used in KoW which uses square bases, I found that the giant 100mm round base fits neatly into a movement tray, so I’ll just park it in there when I need to. …and yes. I just ordered a bunch of Argonauts from Foundry this evening! 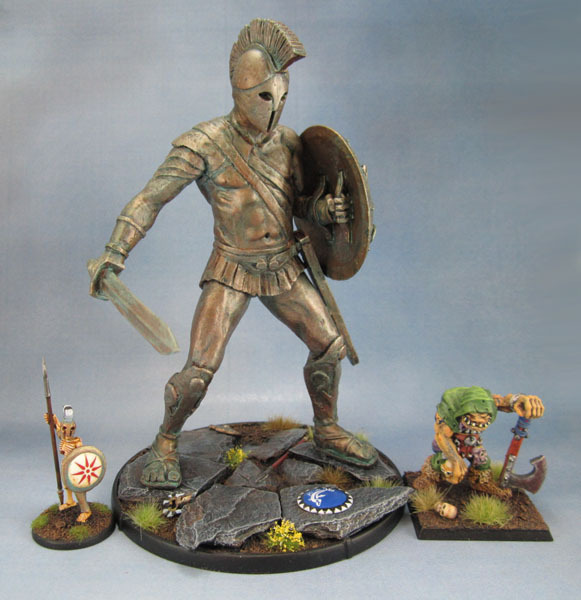 This entry was posted in Mythical Greek Army and tagged Ancient Greek, Colossus of Bronze, Mythic Greek, Talos, Talos (Mierce Miniatures). Bookmark the permalink. magnificent! love the green brass effect on themodel. Great job! And I only appreciated the scale until it was next to the old ogre…woah. Loved it, it immediately reminded me of Jason and the Argonauts. Just the right amount of verdigris. Thanks for sharing this masterpiece. Nice work, the result is spot on in my view. 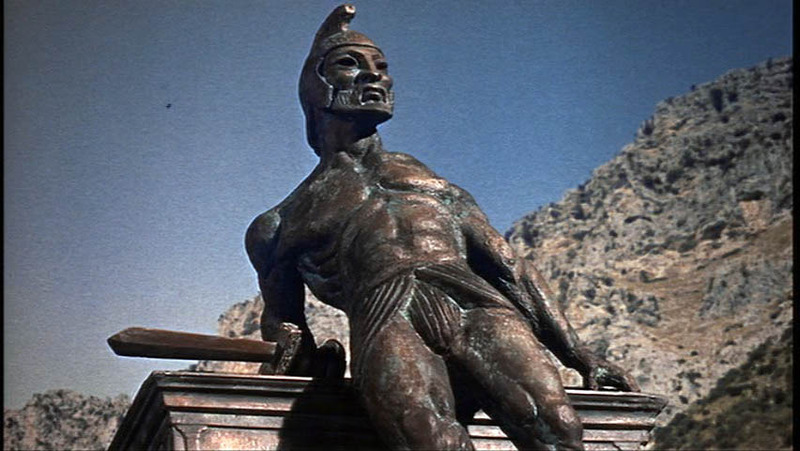 I watched a BBC documentary on Harryhausen the other night, so all of this couldn’t be more timely to make me want to start some ancient mythological gaming myself. Thanks mate. A year on now (I somehow missed your comment!) and it fits well into KoW Historical. I’ve heard mixed reviews about Of Gods and Heroes, but it would also fit that quite well if I manage to start on it. 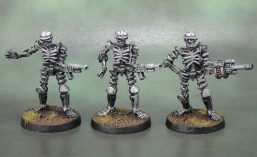 Pingback: Undead Army Showcase – July 2016 | Azazel's Bitz Box. Thank you. I’d like to get back onto some bigger models soon! Pingback: Hell Dorado’s Ashoka: A Painting December Reprise | Azazel's Bitz Box. Pingback: Azazel joins Dreadtober 2017! | Azazel's Bitz Box. Pingback: Painting December 2017 becomes Painting January 2018 | Azazel's Bitz Box.